2009 European championships: Tom Boonen (Quick Step) wins in Belgium. Tom Boonen (Quick Step), whose participation in the next Tour de France may depend on a court order, won the Belgian road cycling championships on Sunday. 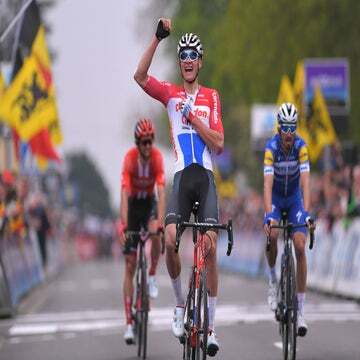 The 28-year-old outsprinted Philippe Gilbert and Kristof Goddart to claim his first national title as an elite on an undulating 234km course that some felt would not favor the big rider’s strengths. Now Boonen must wait to see whether a court will overturn a decision by Tour de France organizers to bar him from this year’s race over an out-of-competition positive for cocaine. It was Boonen’s second positive for cocaine in less than a year. But while the drug is illegal, World Anti-Doping Agency rules do not list cocaine as a performance-enhancing substance unless it is used during competition. Since both tests were conducted outside of competition, Boonen did not violate UCI anti-doping rules and the UCI declined to pursue other charges based on the assertion that Boonen had brought disrepute to the sport of cycling. A verdict is expected Tuesday. “Before thinking about the Tour, I want to savor my victory on Sunday,” Boonen said. “We’ll see what happens on Tuesday.” — Agence France Presse contributed to this report. The young Dimitri Champion, riding for the modest Bretagne-Schuller team, won the French road cycling title on Sunday. Française des Jeux teammates Anthony Geslin and Anthony Roux finished second and third, respectively. Champion was away with Geslin when Roux bridged up at the foot of the final climb. “I knew that if I got two of the Française des Jeux against me, I was cooked. So I attacked, and I managed to hold them off to the end,” he said. The 25-year-old Champion, who previously won the amateur national time-trial title, turned pro with Bouygues Telecom in 2007. But the team did not renew his contract, and Bretagne-Schuller picked him up in 2009. The third-division Continental squad will not participate in the Tour de France, and so its newly minted national champion will not be able to display the tricolor in Le Grande Boucle. For the first time in years the use of race radios was prohibited during the French national road championships. “”It was funny, there were more conversations between riders, it was another race,” said Champion. Ruben Plaza (Liberty Seguros) became the Spanish road champion on Sunday in El Soplao, beating Constantino Zaballa and Mikel Astarloza. Plaza took the bronze behind Alberto Contador in Friday’s individual time trial. The 195km race was marked by a breakaway of 22 riders who took nearly three minutes on the bunch before being retrieved 25km from the finish. Several riders tried their luck in the final climb, but it was Plaza who prevailed by three seconds over Zaballa and seven ahead of Astarloza. Filippo Pozzato (Katusha) proved victorious on Sunday in the Italian national road championships. Pozzato, 27, outsprinted a group containing Damiano Cunego and Luca Paolini to win the 257.3km race, which consisted of 11 laps on a circuit in Imola. Andy Schleck (Saxo Bank) won his first Luxembourg road championship on Sunday in Differdange, succeeding his brother Fränk. The 23-year-old Schleck escaped with 70km to go and never looked back, finishing nearly two minutes ahead of Laurent Didier. Brother Fränk rounded out the podium in third. Matti Breschel (Saxo Bank) outsped a pair of teammates — Chris Anker Sørensen and Frank Høj — to win the Danish road championship on Sunday. The 23-year-old Breschel crossed the line in the 196km race just four seconds ahead of Sørensen with Høj a further nine seconds in arrears. “I needed to prove something today,” he said afterward. Fabian Cancellara (Saxo Bank), better known as an individual time trialist and a man for the classics, won his first Swiss national road championship on Sunday. The big Swiss, who has six national titles in the race against the clock, out-sprinted Mathias Frank for the road crown in the 180.4km race. Thomas Frei took third, 18 seconds back. Martin Reimer (Cervélo TestTeam) outfought Dominic Klemme for the German national road title on Sunday, with Roger Kluge third. Fabian Wegmann, the champion during the past two years, had to settle for fifth in the 240km contest. Veteran Marcus Ljungqvist (Saxo Bank) collected his third national road title on Sunday, out-kicking Fredrick Ericsson (Team Capinordic) to win the 201km race. Patrik Morén (Vallentuna Cycling Team) finished third at 13 seconds. Ljungqvist, 34, previously won the national championship in 1996 and 2001. Kurt-Asle Arvesen defended his Norwegian road crown on Sunday, soloing in for the victory just three seconds ahead of a five-man pursuit after 187km of racing. Alexander Kristoff took second followed by Thor Hushovd in third. It was the fifth title for Arvesen, 34, and the second consecutively. Moerenhout, 25, previously won the national title in 2007. Last year, he finished second to Lars Boom. 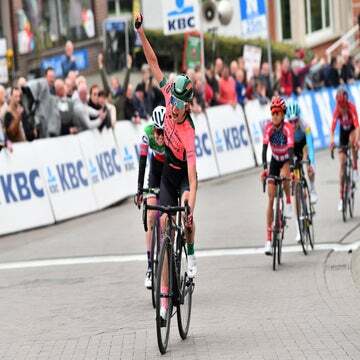 It was the first win this season for Moerenhout, who did not make Rabobank’s team for the Tour de France. Markus Eibegger won Sunday’s Austrian road cycling championship, defeating Martin Schšffmann and Bernhard Eisel. It was the 24-year-old Eibegger’s first national championship. The winner of the past two years, Christian Pfannberger, did not compete; he was suspended in May by his Katusha team after testing positive for EPO. 4. Greg Van Avermaet, s.t. 7. Christophe Riblon (Ag2r), s.t. 8. Stéphane Auge (Cofidis), s.t. 9. Julien Simon (BCS), s.t. 10. Nicolas Jalabert (Ag2r), s.t. 9. Juan José Cobo, s.t. 4. Brian Bach Vandborg (Liquigas), s.t. 3. Joost van Leyen, s.t.